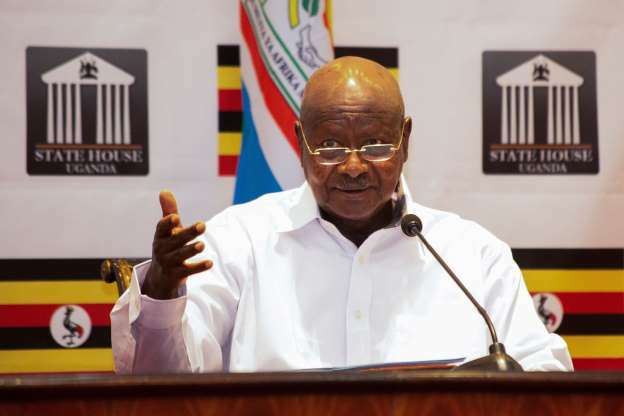 KAMPALA- President Yoweri Museveni on Tuesday urged Parliament to develop a different salary structure for scientists that corresponds with their international status. Museveni made the remarks while commissioning the new Mulago Specialized Women and Neonatal Hospital which cost 25 million US dollars. Museveni said, with such facilities available locally, there would not be need for anyone to travel abroad and spend money on treatment. “In the near future, medical tourism of going to countries like India should stop. You either get saved or die from here but not going abroad because we have the facilities here,” Museveni said. Earlier, the Minister for Health, Dr.Ruth Aceng had noted that efforts are in high gear to ensure each division in Kampala has a specialized hospital to help decongest Mulago hospital. Dr. Aceng said the move to construct the Specialised Women and Neonatal Hospital was necessitated by the big numbers of women who slept on the floor whereas children shared beds at the old Mulago hospital. “The President ordered for the construction of a new facility to help decongest Mulago but also enable people with complications also be treated from here other than being taken abroad, ”Aceng said. Dr. Byaruhanga Baterana, Executive Director of Mulago Hospital, said the facility has been equipped and there will be no excuses for people to travel abroad seeking better medical care. He, also rallied the government to increase the budget allocation to Mulago Hospital. “The budget is quite small. We need about Shs.101 billion to run the hospital but get Shs.14.3 billion only,” he said. The hospital will offer the following services: high-risk antenatal care, delivery, postnatal services, gynaeco-oncology, urogynecology especially focusing on obstetric fistula (VVF), assisted reproductive health technologies, intensive care services and operation theaters offering laparoscopic surgery.